Conventional diamond tools rely on the mixing of diamond with metal powders and subsequent loading in to dies that normally leaves significantly poor distribution of the diamond. The objective of placing diamond into the metal matrix is to ensure the best possible layout of the diamond to ensure optimal use of that diamond as and when the wear of the tool requires it. Patterned diamond technology is quite new in the world of Diamond Tools. Original pattern technology has proven to be ineffective in several ways with the diamond placed in a far too structured way, leading to “tracking” of diamond and thus loss of life and far reduced cutting speeds. Quite the opposite to the original objectives. RAT by TRAXX employs a unique method of diamond placement in a structured BUT random manner. This IS the optimum method. RAT means that diamond can be placed in virtually any position, totally eliminating “tracking”, and thus allowing for use of mixed diamond sizes and concentration levels of diamond. The real result is significant improvement in tool cutting speed, life and flexibility of application. 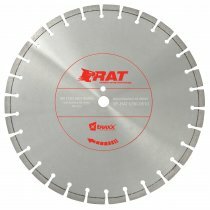 Hence RAT tools are available for floor saws, hand-held saws, including hydraulic and ring saws, precut saws, wallsaws and even tile and masonry saws. Results in poor tool life and slow cutting speeds. Results in low to very low cutting speeds. Technology The result is significantly improved speed and life of the tool.